I’ve had many new years resolutions over the years. Some were kept and many faded slowly over the first few months of the year. What I noticed was that before starting The Prepary, most of my resolutions were personal and not professional, but they should have been a mix. A fresh new year is a great time to make some career related commitments and goals. They will pay off throughout the year in big and small ways. 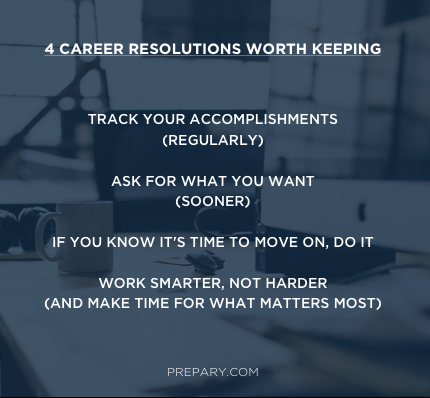 Here are 4 career resolutions that you should consider adding to your list this year. They’re things I learned from my personal experiences, time spent in recruiting and HR, and things I often tell clients to do to help them meet their career goals. Most of us do not give ourselves enough credit for the stuff we do well. Tracking your accomplishments will help you in many different scenarios whether you’re interviewing for a new job, writing a self-assessment for year-end reviews, or asking for a raise/promotion. A lot can happen in a year, and while it’s pretty easy to look back and make a big picture observation of what you did well, giving specific examples that span the year will help make your case… and those are super tough to remember if you’re not keeping tabs. So whether you keep a list in your iPhone notes, Evernote (my preferred digital notebook), or a physical notebook, make a commitment to logging your accomplishments every few weeks while they’re fresh in your mind. This is actually one of my biggest learnings in my career so far. There have been many times since entering the workforce where I would start to realize that I wanted something different out of my work situation but I wouldn’t have the courage to bring it up. At times it was wanting more responsibility, at times a promotion or raise, and at one point it was wanting to move to a part time schedule to focus on my business (a pretty untraditional ask). I spent so much time worrying about what the reaction was going to be on the other end and would hold off on having the conversation. Then I would keep feeling that way, keep thinking about it, and eventually would get to the point where I’d make my case… months or even years later. Almost every one of those conversations ended up having a positive outcome… and when I think of all the time I wasted by not speaking up, I regret it. If this sounds like you, this is a great career resolution to add to the list. Speak up sooner! 3. Trust your gut – if you know it’s time to move on, do it this year. Along those same lines, if you’ve been unhappy in your job and have felt for a while that it’s time to move on, go ahead and do it. While there are some situations where you want to stay in a job for a certain amount of time, I find that most people stick around in non-ideal situations for way longer than they need to. Launching a new job search can be a daunting process… but if you choose your next move wisely, it will be worth it. Make 2015 the year you transition into a better work environment or more challenging/fulfilling job. This resolution is one that’s made it on my list before. Cut out the big time wasters in your day and put emphasis on quality of work versus the number of hours you spend at the office. Getting your work done efficiently will allow you to make time for the things you love to do outside of work. I am definitely noticing that “face time” is becoming a concept of the past. More and more workplaces are embracing working remotely and flexible hours. The trend is to trust employees more, give them more ownership over their work, and judge the outcome, not the hours put in. I think this is something we’re all happy to get on board with, but it means showing really tangible results (however that is measured in your industry or job). What career-related resolutions are you making this year? Would love to hear from you in the comments. Happy (almost) New Year everyone! It’s going to be a wonderful 2015. My 2013 Career Resolution: Battling my productivity enemies!